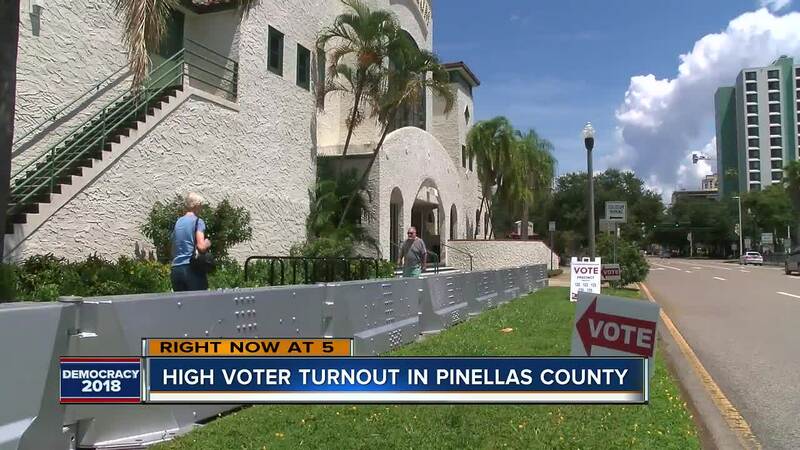 PINELLAS COUNTY, Fla. — Election officials in Pinellas County describe Tuesday's primary voter turnout at much higher than expected. At voting sites across the county, a steady stream of voters cast their ballots throughout the day, including many who dropped off previously filled out mail ballots. “I love it. It wasn’t like this the last time we went to vote at all! It's so busy," Largo voter Linda Gentry explained. ABC Action News heard a wide range of reasons from voters about why they decided to cast a ballot, but four topics came up again and again: The economy, jobs, gun control and immigration. With so many of those issues taking center stage in Florida this year, this primary is drawing even more voters than in 2014 and 2016 — which was a presidential primary. 2 million voters in Florida cast a ballot by mail before the polls even opened on Tuesday. “That’s incredible. When you think about how many people are in Pinellas County and how many people are turning in their ballots, we’re really excited about it," explained Dustin Chase with the Pinellas County Supervisor of Elections office. Voters tell ABC Action News they hope they can make a difference at the local and state level. "This is a very important primary because it’s going to shape the future of our country," Bullock added.